It would take over a heart pounding 90 minutes, with each set decided by two points. The Rocks would end up outlasting the Bearcats and keeping their perfect record in tacked, winning in three sets, 25-27, 27-25, 28-26. Kirsten Leimkuehler had a game high 12 kills for the Bearcats. Emily Kallmeyer led the Rocks with 6 kills. Katie Peirck added 5 kills, 8 service points, and 4 aces. Mackenzy Vedder added 4 kills. Pictured right: Leimkuehler smokes one of her 12 kills on the night. In the finial set, the Rocks showed why they have been nicknamed “Come Back Kids” after Hermann came out scoring the first five points. 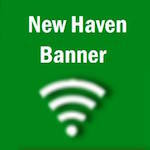 It appeared as though New Haven had nothing left when they proved there was a reason for being undefeated. Kallmeyer lead her team knocking down four of her five kills. The Rocks unwillingness to loss the desire to win, earned them their 14th win of the season defeating the Bearcats in 90 minutes of electrifying volleyball 26-28. This was the Rocks second conference win and they will travel to Sullivan tomorrow night in another Four Rivers Conference battle. The Lady Bearcats will host St. Clair tomorrow night in another coference battle.